Whether your want to call this recipe a proper soup or simply deconstructed lasagna, there’s one thing that’s certain—it’s delicious. The noodles soak up the rich tomatoey broth, and the dollop of a simple ricotta mixture on top adds a needed bit of creaminess. It’s like a little bit of Italy in a bowl. As you might notice in the photos here, the finished product looks a bit more like traditional pasta than like soup…I’m fairly certain I added the whole box of pasta rather than the 8 oz. required. Oops! If you want your meal to be more soup-like, just add less pasta and/or additional broth. Feel free to ramp up the spice levels too by adding more red pepper flakes of even a splash of hot sauce. 1) Heat a bit of olive oil in a small pan over high heat. Add the whole garlic cloves and sauté until they start to brown. Be sure to stir as needed so the olive oil doesn’t burn. 2) In a large pot or Dutch oven, heat a bit of olive oil over medium heat. Add the onions and cook until softened. Add the oregano, rosemary, red pepper flakes and tomato paste and stir well. Allow to cook for 3-4 minutes. 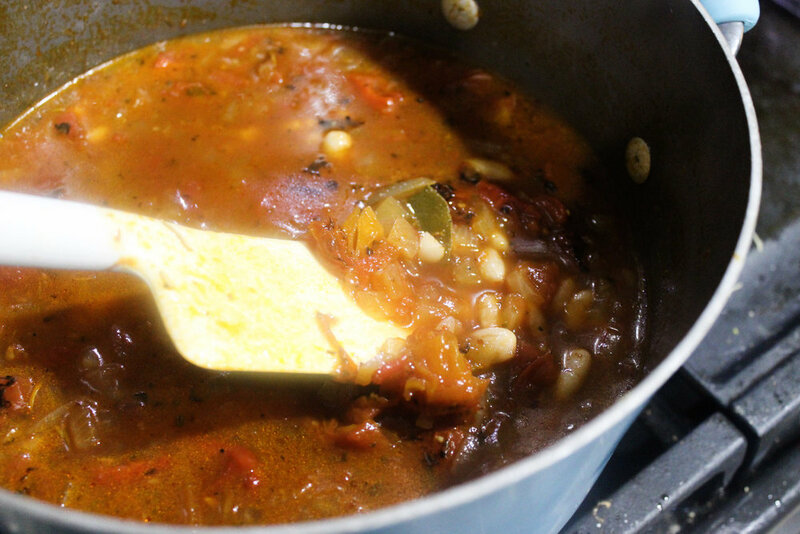 3) Add the tomatoes, red peppers, vegetable broth and bay leaves. Season with salt and pepper. Bring to a boil, then reduce heat and simmer for 30 minutes. Add the white beans. 4) Scoop a bit of the soup into a food processor and purée it with the garlic cloves. Add the puréed mixture back to the pot. 5) Add the uncooked pasta and simmer on low until the pasta is fully cooked. Add more spices/seasoning, if desired. 6) In a small bowl, combine the ricotta, Parmesan, lemon juice, parsley and basil. Season with salt and pepper and stir well to combine. 7) Ladle the soup into bowls and top with a dollop of the ricotta mixture.